Welcome to Apple Vision where your vision and eye health are our primary concern. We look forward to meeting you and helping you with all of your eye care needs. Apple Vision, the longtime practice of Dr. Paul Geller, located in Sandy, Taylorsville and South Jordan Utah, has long been recognized as a leader in patient care. Since we started in 1985, our optometrists and opticians have offered the highest standards of quality and individualized attention in a relaxed, professional atmosphere. Please don’t hesitate to contact us if you are concerned about your general eye health or are interested in LASIK screening, hard-to-fit contact lenses, or treatment of conjunctivitis. 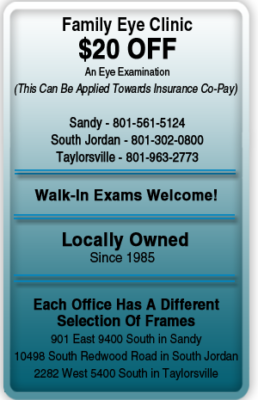 Our optometry offices are conveniently located throughout Salt Lake County. We look forward to seeing you! Please contact us to schedule your appointment today.